. إن Phoenician Resort حريص على توفير الراحة للنزلاء، فلا يوفر الموظفون جهداً في تقديم أفضل الخدمات وضمان حسن الاستقبال. يمكن لضيوف الفندق الاستمتاع بالميزات التالية على أرض الفندق: واي فاي مجاني في جميع الغرف, متجر, مطبخ, تخزين الأمتعة, صف السيارات . في الفندق غرف نوم يتجاوز عددها 110، كلها مجهزة بعناية وجمال وبعضها مزود بـ تلفزيون بشاشة مسطحة, غرف لغير المدخنين, مكيف هواء, تدفئة, مكتب. يقدم الفندق خدمات رائعة كمثل مركز للياقة البدنية, ساونا, مسار جولف - ضمن 3 كم, حمام سباحة خارجي, حمام سباحة داخلي لمساعدتك على الاسترخاء بعد نهار طويل من النشاط والتجوال في المدينة. يحظى فندق Phoenician Resort بموقع ممتاز وخدمات يصعب منافستها. Been staying here for over 8 years and always exceptional on all counts. Multiple pool areas are great for all ages. All the restaurant you could want just below and adjoining streets. Close to Grocery shopping. Tram at the back door. All you could want in a holiday. staff was friendly, the apartment was well equipped and cleanliness was good. reception hours are from 8 to 8 which may be important to some travellers (it did not affect our travel arrangements). luggage hold available. the bed we had could do with an update and the couch wasn't great, but both were "doable". we did not pay five star, so we didn't expect five star. Centrally located with a massive variety of places to eat at your door step. Close to the beach, Casino, Convention Centre and Pacific Fair. The reception staff were friendly and welcoming. The apartment was roomy and clean and the bed was comfortable. The only problem i had with the hotel is that my keycard needed to be reset a few times due to some technical issues, which were quite irritating. But its funny that they would charge to have extra toilet paper delivered to your room. My partner who is a partial quadriplegic had to go down to get some at the reception. And they expect you to throw your rubbish out before checking out or you’ll lose your deposit. Dont like the sound of that for a hotel. I think you should rethink some of your policies. Receptionists are very friendly though. Walk out of the hotel onto a street of cafes, bars and restaurants. A couple of blocks on and you are onto miles of beautiful beaches.Turn left out of the hotel and the tram is less than 2 mins . Reception staff were fantastically helpful . The pool is like swimming in a tepid bath no goosebumps. Rooms are comfortable ,kitchen well equiped.Secure car parking. Great location. Staff very helpful. Was under the imspression that it was an actual hotel room rather than a hotel style room (ie. looks like a hotel room without the regular servicing). Full Foxtel was great, pool facilities were really good. Room and fittings are a bit outdated and in need of an upgrade but was very clean and serviceable. The resort was perfect for us, 3 women in our fifties. Restaurants and beach a short walk away, reception staff very friendly and helpful. Transport close as well and easy to use the trams and buses. Resort pool inside and out with a spa. Loved our apartment, was more spacious than I thought it would be and was quiet with doors/windows clsoed. Just be aware that as it is self service you just get a couple of things to get you started and anything additional is up to you to buy. First time we've stayed in self service apartment so not used to that but it wasn't an issue. I would definitely stay here again! The hotel is in a great location, just a short walk to the beach and with plenty of bars/restaurants and shopping in the immediate vicinity.. the poo. Area looks great though we did t use it. The gym could use some du bells and free weights as it only has fixed machines which is very limiting but other than that we had no complaints. The location Fantastic central n convenient yet slightly out from the hustle n bustle of Surfers Pradise. All around the resort is food joints from Local to Thai, to Indian,Malay, Italian,Japanesse & Korean all 5mins away walking distance. A few pubs around for u to unwind. Malls,shopping center & supermarket just walking distance. The staff Amazing & so helpful especially Julia. The apartment is so great with all that is needed for a couple to a big family or group of friends. Will definitely return to Gold Coast to stay at Phoenician!!! Only downside the Wifi is so Expensive!!!! It was my birthday weekend away with a girl friend and it was great. The staff and friendly and easy to deal with. The room is clean and tidy and the general areas are fresh and clean. This was the second time staying there and will be back again I'm sure. Location, clean and large room. Very good location. Less than 2 mins walk to Broadbeach North Station. Many restaurants to choose from. The beach is only less than 5 mins walk. Security is good. Using key card access all gates and lift. They will only service your room every 4 nights. The Wifi is NOT FREE. I will return! FIne, obviously very central in broad beach, not large rooms but clean and cosy. only issue is the $250 bond is not refunded for 5-7 days. this is theft. its that simple, other hotels release the credit card hotel back on to your card immediately, why can't this hotel follow suite. totally understand the need for a bond. won't be returning till this robbery stops. As always my stay at the Phoenician was great. It is a convenient and lovely place to stay with very helpful and attentive staff in the heart of Broadbeach. Highly recommend this hotel whether staying in the Gold Coast for business or pleasure. Our stay was good and suited us to enjoy the music of the Blues festival. The one bedroom apartment is ideal for a couple, with plenty of wardrobe space. Staff quickly responded to our issue with the air conditioner. The only downside was that our apartment was looking a bit tired and in need of some renovation, but would definitely stay here again. Great stay. Really spacious room and close to everything. Friendly staff. All amenities fantastc. Nice living area with comfy leather couches. Above all the restaurants but you coulnt hear any outside noise. Will be back. Loved the indoor pool too! Staff were very helpful, rooms were clean and comfortable. The pool areas were nice with plenty of room around outdoor pool to relax in the sun or shade. Best location with everything so handy - beach, shops, casino, surf club. Really great time very relaxing, room was very comfortable and inviting. Plenty of space in the room with a good bed and bathroom. Pool was lovely. Hotel is located in a great agrea. Would come back again. The Phoenician was a wonderful experience. The location in the main strip with a variety of excellent restaurants, shopping and close proximity to the beach with parking included in the tarrif were perfect for our needs. The apartment was spotless, tastefully decorated and roomy. The balcony provided wonderful views of the ocean and river. The staff were friendly and efficient. 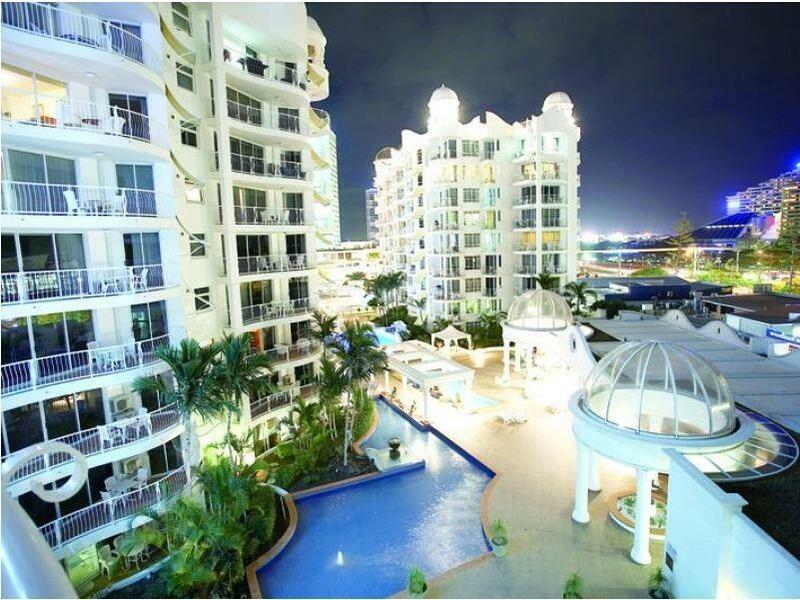 We have stayed in many Accommodation places in Broadbeach and this is by far the best value for money. We will be returning.